In his Companion to ‘Our Mutual Friend,’ Michael Cotsell includes an extended note about the prevalence of starvation in the streets in mid-19th century Britain and the attempts to improve the Poor Laws. His brief history is a useful supplement, I think, to Podsnap’s discourse on the poor (Book 1, Chapter 11) and the conclusion of Betty Higden’s “long journey” (Book 3, Chapter 8). The Oxford University Press edition of Our Mutual Friend (1987, reissued 2008) begins with an essay by the editor, Michael Cotsell, in which he places the book within an intriguing historical context: the changing social and cultural attitudes of writers as the mid-Victorian evolved into the late-Victorian period. Cotsell discusses the influence of Darwin on Dickens’ imagery in Our Mutual Friend, for example. He also makes reference to novels and authors we’ve already read – from Great Expectations and Bleak House to Barchester Towers and Wives and Daughters; from Dickens and Trollope to George Eliot and Henry James. The Introduction is of moderate length – 8 pages. I post a PDF here and will bring some hard copies to our meeting on Saturday. 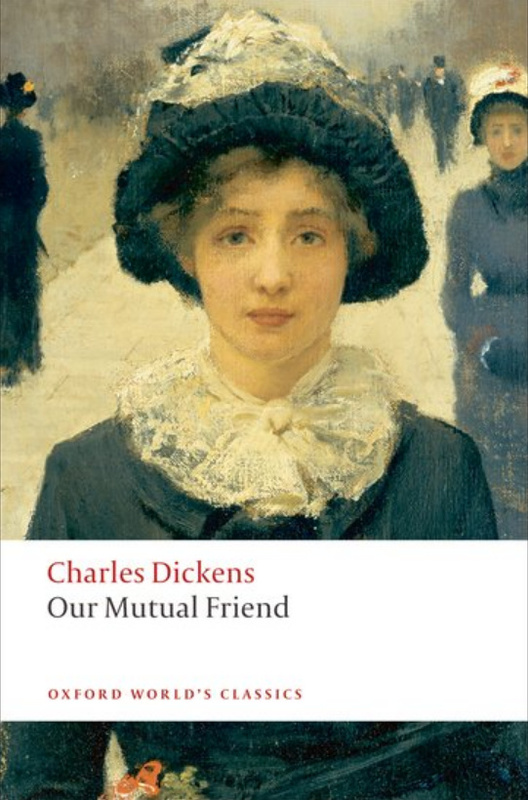 Any priggish pupil teacher could tell Dickens that there is no such phrase in English as “our mutual friend.” Any one could tell Dickens that “our mutual friend” means “our reciprocal friend,” and that “our reciprocal friend” means nothing. If he had only had all the solemn advantages of academic learning (the absence of which in him was lamented by the Quarterly Review), he would have known better. He would have known that the correct phrase for a man known to two people is “our common friend.” But if one calls one’s friend a common friend, even that phrase is open to misunderstanding. Or, perhaps, Dickens wanted the idea of a common, meaning vulgar, friend to lurk behind his title. This would be especially true if he wanted to draw our attention a little away from the commonly assumed hero of the novel to, say, Boffin, who makes first use of the titular phrase in book I, chapter ix. Or maybe not. Don’t think from this little bit of Chesterton’s essay that he disapproves of the title, or the novel. His point is more subtle, and his essay is worth the read. Woven hair watch chain with brown hair. Victoria alerted me to this article in the Guardian about a recently found portrait of Charles Dickens, painted while he was writing A Christmas Carol in 1843. Charles Dickens attempted a (T.S.) Eliot . 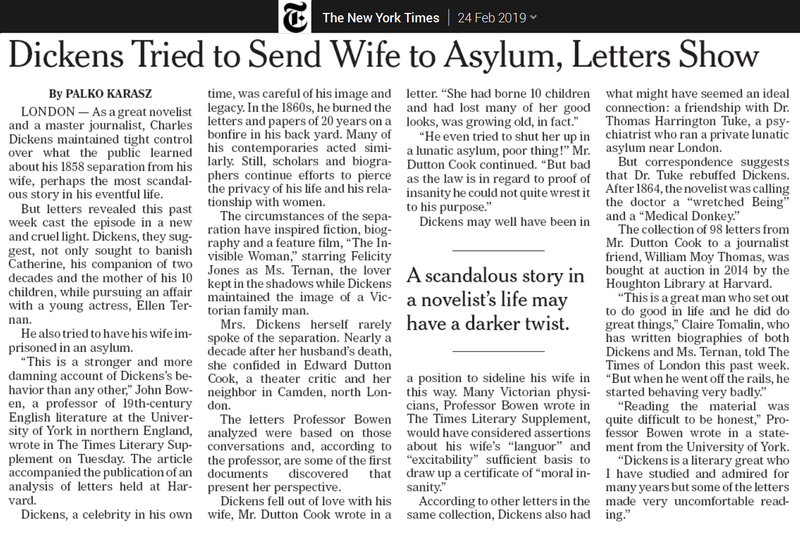 . .
From The New York Times (Sunday, 24 February). Click to expand. The on-line Smithsonian Magazine has also published a slightly longer story about Prof. Bowen’s discoveries. Below is the direct link to the TLS piece published this February. John Harmon – is heir to the Harmon estate, under the condition that he marry Bella Wilfer. He is presumed dead throughout most of the novel, though he is living under the name John Rokesmith, and working as a secretary for the Boffins in an attempt to better get to know Bella, the Boffins, and people’s general reaction to John Harmon’s “death”. Harmon also uses the alias Julius Handford upon first returning to London. Harmon’s “death” and subsequent resurrection as Rokesmith/Handford is consistent with Dickens’s recurring theme in the novel of rebirth from the water. His upward social mobility through his own efforts is presented as favourable, in contrast with Headstone, Hexam, and the Lammles. Bella Wilfer – is a beautiful girl born into poverty, who learns upon the death of Old Mr Harmon that she is the intended wife for his son, a condition of his inheritance. When her intended husband, John Harmon, is reported to be killed, she is left without future prospects. She learns of the trouble money can bring when taken in by the newly-rich Boffins. Bella rejects Rokesmith’s proposal at first but later accepts it. Initially described as a “mercenary young woman”, who describes herself upon meeting Lizzie Hexam as having “no more character than a canary bird”, Bella undergoes a significant moral change in the novel. Although originally completely preoccupied with money, her complexity is eventually displayed in her ability to defy the societal pressures to achieve happiness unrelated to wealth. She is praised for her “vivacity and lifelikeness”, with greater complexity than some of the other, more static characters. Her relationship with her father is more like that of a mother and son, as she consistently dotes upon him, calling him her “cherub”. She has an open and warm relationship with her father, which provides a stark contrast to the strained and resentful relationships between Bella and her mother and sister. Nicodemus (Noddy) Boffin, the Golden Dustman – becomes a member of the nouveaux-riches when Old Mr Harmon’s heir is considered dead. He is illiterate, but wants to fit the image of a wealthy man, and so hires Silas Wegg to read to him in hopes of gaining more intelligence and worldliness. He is nearly blackmailed by Wegg. He assumes the role of a miser to show Bella the dangers of wealth, but eventually admits this behaviour was an act and gives his money to Bella and John. Boffin’s innocence, naïve curiosity, and desire to learn in his new position in life contrast with his “elaborate performances as Boffin the miser”. Critics speculate that Dickens’s decision to have Boffin playing a part may not have been planned, as it was not very convincing for a man who has shown his simplistic ignorance on several occasions. Boffin’s inheritance of Old Harmon’s money is appropriate because Harmon had attained it by combing the dust heaps, because this suggests social mobility. Boffin represents a wholesome contrast to such wealthy characters as the Veneerings and Podsnaps, and may have been based on Henry Dodd, a ploughboy who made his fortune removing London’s rubbish. Mrs Henrietta Boffin – is Noddy Boffin’s wife, and a very motherly woman, who convinces Mr Boffin to take in an orphan boy called Johnny. This indicates “another progressive development for Dickens as his female characters undertake a more active role in social reform”. Lizzie Hexam – is a daughter of Gaffer Hexam and sister of Charley Hexam. She is an affectionate daughter, but knows that Charley must escape their living circumstances if he is to succeed in life, so she gives Charley her money and helps him leave while their father is away. Later she is rejected by Charley after she remains in poverty. Pursued romantically by both Bradley Headstone and Eugene Wrayburn, she fears Headstone’s violent passion and yearns for Wrayburn’s love, while acutely aware of the social gap between them. Lizzie saves Wrayburn from Headstone’s attack and the two are married. She in effect acts as the moral centre of the story and is by far the “most wholly good character […] almost bereft of ego”. Dickens carries over her moral superiority into her physical characterisation. Her “capacity for self-sacrifice […] is only slightly more credible than her gift for refined speech”, making her slightly unbelievable in comparison to her uneducated father and Jenny Wren. Lizzie’s concern about social class reveals her reasoning for ensuring her brother’s escape from poverty and ignorance, though she remains humble about her own situation. However, her moral character attracts Wrayburn and her inherent goodness is rewarded with marital happiness. Charley Hexam – is the son of Jesse “Gaffer” Hexam and a brother of Lizzie. Originally a very caring brother. this changes as he rises above Lizzie in class and must remove himself from her to maintain his social standing. He was born into poverty, but receives schooling and becomes a teacher under Headstone’s mentoring. Dickens uses him to critique both the schooling available to the poor, which was often over-crowded and noisy, as well as the snobbish tendencies of those who manage to rise in status. Hexam is presented as “morally corrupt”, because of how he distances himself from his past, and from his loving sister, in the name of his own upward movement. Mortimer Lightwood – is a lawyer, who is an acquaintance of the Veneerings and a friend of Eugene Wrayburn. Lightwood acts as the “storyteller” and it is through him that the reader and the other characters learn about Harmon’s will. However, under the “mask of irony” he assumes in telling his stories, he feels true friendship for Eugene, respect for Twemlow, and concern for the issues in which he is involved. In addition, he also serves as the “commentator and a voice of conscience” with sarcasm sometimes covering his concern. Through Lightwood’s reason and advice, the reader is better able to judge the characters’ actions. Eugene Wrayburn – who is seen as the novel’s second hero, is a barrister, and a gentleman by birth, though he is roguish and insolent. He is a close friend of Mortimer Lightwood, and involved in a love triangle with Lizzie Hexam and Bradley Headstone. Both these characters act as foils to Wrayburn. Lizzie contrasts with Eugene’s more negative traits and Headstone makes Eugene appear more virtuous. He is nearly killed by Headstone but, like Harmon/Rokesmith, “reborn” after his incident in the river. Though Wrayburn appears morally grey through most of the novel, by the end he is seen as a moral, sympathetic character and a true gentleman, after choosing to marry Lizzie in order to save her reputation, even though she is socially below him. Jenny Wren – whose real name is Fanny Cleaver, is “the dolls’ dressmaker,” with whom Lizzie lives after her father dies. She is crippled with a bad back, though not ugly. She is very motherly towards her drunken father, whom she calls her “bad child”. Jenny later cares for Eugene while he recovers from Headstone’s attack on his life. She may have a romance with Sloppy at the end of the book, which the reader may surmise will end in marriage. Although her mannerisms give her a certain “strangeness”, Jenny is very perceptive, identifying Eugene Wrayburn’s intentions towards Lizzie in his small actions. Her role is a creator and a caretaker, and her “pleasant fancies” of “flowers, bird song, numbers of blessed, white-clad children” reflect the mind’s ability to rise above adverse circumstances. Bradley Headstone – began life as a pauper but rose to become Charley Hexam’s schoolmaster and the love interest of Miss Peecher. However, he ignores her and falls in love with Lizzie Hexam, whom he pursues passionately and violently, though his advances are rejected. He then develops an insane jealousy towards Eugene Wrayburn, whom he follows at night like an “ill-tamed wild animal” in hopes of catching him with Lizzie together. He disguises himself as Rogue Riderhood and almost succeeds in drowning Wrayburn. After Riderhood realises that Headstone is impersonating him to incriminate him for Wrayburn’s murder, he attempts to blackmail Headstone, and this leads to a fight, and both men drowning in the river. Described repeatedly as “decent” and “constrained”, Headstone’s personality splits between “painfully respectable” and “wild jealousy”, with a “passion terrible in its violence”. He is presented by Dickens as an animal in the night and a respectable, “mechanical” schoolteacher during the day. A possible explanation for this dichotomy may be Headstone’s “intellectual insecurity”, that manifests itself in violence after Lizzie’s rejection. The “most complex of Dickens’s villain-murderers are presented as such double-figures”. Dickens here demonstrates the way identity can be manipulated. Headstone also serves as a foil to Wrayburn, and his evil nature antagonizes Wrayburn, as much as Lizzie’s goodness helps him. Silas Wegg – is ballad-seller with a wooden leg. He is a “social parasite”, hired to read for the Boffins and teach Mr Boffin how to read, despite not being entirely literate himself. Wegg finds Harmon’s will in the dust heaps, and he and Venus attempt to use it to blackmail the Boffins. He wishes to buy back his own leg as soon as he has the money, which is an attempt to “complete himself”. Wegg claims to want the leg so that he can be seen as respectable. Some critics find the juxtaposition of Wegg’s villainy and his sense of humour to be inconsistent. Mr Venus – a taxidermist and articulator of bones, who is in love with Pleasant Riderhood, whom he eventually marries. He meets Silas Wegg after having procured his amputated leg and he pretends to join Silas in blackmailing Mr Boffin regarding Harmon’s will, while really informing Boffin of Silas’s scheme. Dickens is said to have based Mr. Venus on a real taxidermist named J Willis, though Venus’s “defining obsession” renders him “among Dickens’s most outlandish, least realistic” characters. Mr Alfred Lammle – is married to Sophronia Lammle. Both of them, at the time of their marriage, was under the false impression that the other was fairly wealthy. Subsequently, they are forced to use their overabundance of charm and superficiality, in attempts to make influential acquaintances and gain money through them. Mrs Sophronia Lammle – is described, early in the novel, as “the mature young lady” and a proper young woman. However, this turns out to be ironic as she is later shown to be greedy, cold, and manipulative. She married Alfred Lammle because she believed he had money, and when it turned out he did not, the two of them formed a partnership that involves swindling money from others. They, for example, conspire to trap Georgiana Podsnap in a marriage with Fledgeby, though Sophronia repents before this plan can come to fruition, and arranges for Twemlow to inform the Podsnaps without her husband’s knowledge. Georgiana Podsnap – a daughter of Mr and Mrs Podsnap, who is very sheltered, shy, trusting and naïve. because of this she is taken advantage of by more manipulative upper-class characters, such as Fledgeby and the Lammles, who scheme to “befriend” her and take her money. She is courted by Fledgeby, through Alfred Lammle, though not with honourable intentions, and nearly finds herself trapped in a marriage with Fledgeby until Sophronia Lammle suffers a change of heart. Mr Fledgeby – called Fascination Fledgeby is a friend of the Lammles. He owns Mr Riah’s moneylending business and is greedy and corrupt and makes his money through speculation. He provides a contrast with Mr Riah’s gentleness, and underlines the point that “a Jew may be kindly and a Christian cruel”. Fledgeby nearly marries Georgiana Podsnap to gain access to her money, but Sophronia Lammle backs out of the scheme and, once Fledgeby is no longer allied with the Lammles, they seek him out and beat him. Roger “Rogue” Riderhood – “Gaffer” Hexam’s partner until Gaffer rejects him when he is convicted of theft. In revenge for that slight he falsely turns Gaffer in as the murderer of John Harmon, in the hope of receiving a reward. Later, Riderhood becomes a lock-keeper, and Headstone attempts to frame him for the murder of Eugene Wrayburn. After attempts to blackmail Headstone, the two men fall in the river Thames during a fight and both drown. In his “literally irredeemable villainy”, Riderhood represents an opportunistic character who will change his behaviour according to whatever suits his needs best at any given moment. Reginald “Rumty” Wilfer – is Bella Wilfer’s doting father, who is gentle, innocent, fatherly and kindly, despite his querulous wife and daughter and thankless work as a clerk. Dickens describes him in almost childish terms and he is often called “the Cherub”. Mr Inspector – a police officer, who acts as a witness to several important events, such as when the corpse from the river is mistakenly identified as John Harmon, when Gaffer Hexam is taken into custody, and when the real John Harmon is named. In general, he is “imperturbable, omnicompetent, firm but genial, and an accomplished actor”, who commands authority. However he is not particularly effective in his administration of the law, and this leads to doubt about the justice system in the novel. Mr John Podsnap – a pompous man of the upper middle class, married to Mrs Podsnap and the father of Georgiana, who is smug and jingoistic. 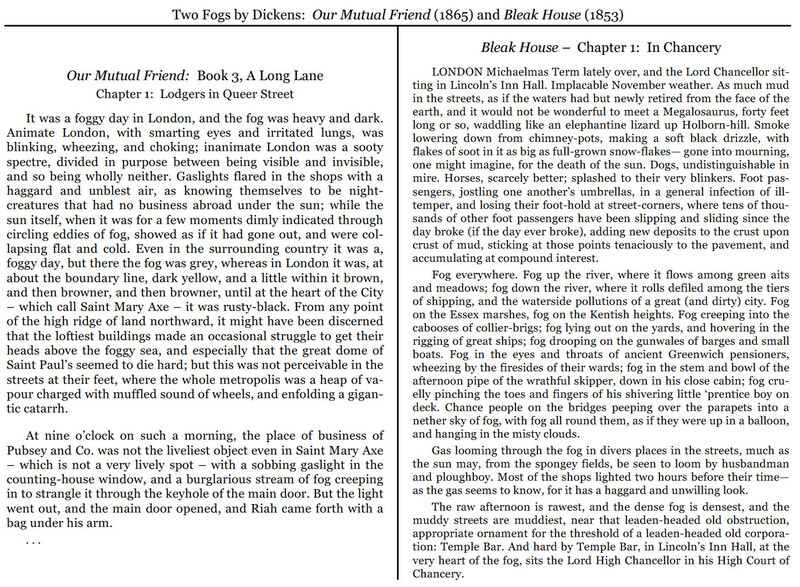 Some critics believe that Dickens used Podsnap to satirise John Forster, Dickens’s lifelong friend and official biographer. However, Dickens insisted he only used some of Forster’s mannerisms for this character, who was in no way to represent his closest friend. Forster, like Dickens, rose with difficulty from an impoverished middle-class background. The character of Podsnap was used to represent the views of “Society,” as shown in his disapproval of Lizzie Hexam and Eugene Wrayburn’s marriage. Mrs Podsnap – the mother of Georgiana Podsnap. Though she embodies the materialistic ideals of her husband and daughter, Mrs Podsnap is the least prominent of the family. She is described as a “fine woman” in her embodiment of the typical upper-class wife. Mrs Wilfer – Bella’s mother, a woman who is never satisfied with what she has. Her haughtiness is apparent in the way she acts at the Boffins’s home and when Bella and Rokesmith return after their wedding. Her animosity towards her husband, her greed and discontent contrast with her husband’s good nature and provide an image of what Bella could become, should she not change. Lavinia Wilfer – Bella’s younger sister and George Sampson’s fiancée. Vocal and opinionated, she is the only character who will stand up to Mrs Wilfer by matching her derisiveness and audacity. In some ways, she acts as a foil to Bella, and while Bella overcomes her desire for money and appreciates other aspects of life, Lavinia remains resentful in her poverty. George Sampson – Lavinia Wilfer’s suitor, who was originally in love with Bella. He provides comic relief and a contrast with the idyllic relationship between Bella and Rokesmith/Harmon. Mr Melvin Twemlow – the well-connected friend of the Veneerings, who is often cultivated for his supposed influence with powerful people, such as Lord Snigsworth. Mrs Lammle tells him about their plot to marry Georgiana Podsnap and Fledgeby, to whom Twemlow owes money. Though Twemlow is introduced as being as insensible as a table at the Veneerings’ dinner party, he comes to reflect a wise way of thinking. His wearing of a collar and cravat creates “picturesque and archaic” impression, and he proves himself a “true gentleman in his response to Wrayburn’s marriage”. Mrs Betty Higden – a child-minder, who takes in poor children and cares for them, including Johnny, the orphan whom the Boffins plan to adopt before he dies in the children’s hospital. She is old and poor, and portrayed sympathetically as pitiable. She is so terrified of dying in the workhouse that, when she begins to grow sick, she runs away to the country and ends up dying in Lizzie Hexam’s arms. Mrs Higden draws readers’ attention to the miserable lives led by the poor, and the need for social reform. Johnny – the orphan great-grandson of Betty Higden. The Boffins plan on adopting Johnny, but he dies in the Children’s Hospital before they are able to do so. Sloppy – a foundling who assists Betty Higden in taking care of children. Raised in the workhouse, he has a learning disability, but is nevertheless adept at reading the newspaper for Mrs. Higden. He is portrayed as inherently innocent because of his disability, and carts away Wegg at the end of the novel. Jesse “Gaffer” Hexam – a waterman and the father of Lizzie and Charley, who makes a living by robbing corpses found in the river Thames. His former partner, Rogue Riderhood, turns him in for the murder of John Harmon after Harmon’s body is supposedly dragged from the river. A search is mounted to find and arrest Gaffer, but he is discovered dead in his boat. Gaffer’s opposition to education prompts Lizzie to sneak Charley away to school, though she stays with her father. As a result, Gaffer disowns Charley as a son. In a sense, Gaffer predicted the alienating effect education would have on Charley. Pleasant Riderhood – the daughter of Rogue Riderhood, who works in a pawn shop, and, like Jenny Wren and Lizzie Hexam, is another daughter caring for her abusive father as though he were her child, and who, in vain, tries to steer him along the path of right. She eventually marries Mr. Venus. Mr and Mrs Veneering – a nouveaux-riches husband and wife whose main preoccupation is to advance in the social world. They invite influential people to their dinner parties where their furniture gleams with a sheen that they also put on to make themselves seem more impressive. They “wear” their acquaintances, their possessions, and their wealth like jewellery, in an attempt to impress those around them. Veneering eventually goes bankrupt and they retire to France to live on the jewels he bought for his wife. Miss Abbey Potterson – mistress of the Six Jolly Fellowship Porters, she keeps the inn respectable, and only allows patrons to drink as much as she sees fit. She is likened, humorously, to a schoolmistress, linking her to the novel’s concern with education. Miss Peecher – a school teacher who is in love with Bradley Headstone. She is a “good and harmless” character, though she displays an “addiction to rules and forms”. In addition, she shows a “naive confidence in the outward appearance of things”, as demonstrated by her love of Headstone, a villain who gives the impression of being good. Mr Dolls – Jenny Wren’s alcoholic father. Jenny calls him her “bad child”, and treats him accordingly. His real name is not known to Eugene, so Eugene calls him “Mr Dolls”. As his daughter is really named Fanny Cleaver, his name might be Mr. Cleaver, but he is never called by a name other than “my bad child”, or “Mr Dolls” in the novel. George Radfoot – third mate on the ship bringing John Harmon back to England, whose dead body, found in the river by Gaffer Hexam, is identified as being Harmon, because of the papers found in his pockets. He had been involved in crimes and schemes with Riderhood, who most likely was responsible for trying to kill Harmon and killing Radfoot.